There are perfectly valid reasons why somebody might question President Trump’s veracity when he says he’s pro-life. The explanation Pope Francis gave is not among them. Admitting that he had insufficient knowledge of what he was talking about, the pontiff criticized Trump’s decision to rescind President Obama’s executive order on “Deferred Action for Childhood Arrivals” (DACA), which allows people to remain in the United States if they had been brought in illegally as minors. “The president of the United States presents himself as pro-life, and if he is a good pro-lifer, he understands that the family is the cradle of life and its unity must be protected.” That’s stretching the definition a bit, but more importantly, it gets the issue completely backward. Even if DACA is reenacted, illegal alien parents who brought their children here illegally would still not be entitled to stay. Deporting the children to their home countries along with those parents is how to keep their families unified. It’s letting them stay that could break families apart. “I think the law comes not from Parliament but from the executive,” he continued. “If that is so, I am hopeful that it will be re-thought.” Would it be too much to ask the Pope to have some knowledge of American civics, as long as he is going to offer policy advice? His attempt to lend moral authority to open borders advocacy by tethering it to right-to-life issues is more hypocritical than any hypocrisy of which he’s accusing Trump. For it is Francis whose other political positions demonstrate a radical disrespect for the value of humanity. During that same interview, the Pope turned to his favorite issue, “climate change” – the belief that the earth is threatened by human freedom, human prosperity, and ultimately humanity itself. “Whoever denies it has to go to the scientists and ask them,” he said, “They speak very clearly. Scientists are precise.” Is that why they use the terms “carbon” and “carbon dioxide” interchangeably? Just curious. These precise scientists are the ones who have told us that manmade global warming causes more hurricanes. No, fewer. No, more. Well, they’ll get back to us on that. They also precisely insist that we are hurtling toward global destruction from “climate change” even though far more violent swings in the earth’s temperature have occurred in the past, without any such catastrophic effects. When their projections for temperature increases don’t pan out, they go back and arbitrarily lower temperatures from decades past, so that today’s will appear higher by comparison. It’s not science about which Francis hears them speaking clearly, but their completely undisguised political ulterior motives. What are the solutions the voices of science prescribe for “climate change”? Global wealth redistribution, anti-industrialism, population control, elimination of property rights, a contrived, dramatic reduction in people’s standard of living, and a general reordering of the universe guided by an extreme devaluation of the human race. In other words: socialism. No wonder he’s so eager to accept their pseudo-scientific pronouncements on “climate change,” whereas he might not want to ask likewise politically corrupted scientists for their opinions on intelligent design. If socialism is what’s going to “save the planet,” then that surely justifies his fraternizations with some of the worst people on the face of the earth. 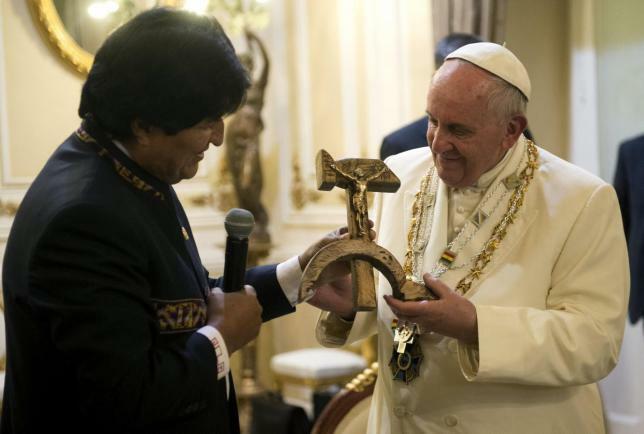 Francis has infamously accepted a hammer-and-sickle-shaped crucifix from Bolivian Communist goon Evo Morales. He’s visited Cuba, in a public relations coup for the Castro government, where he conspicuously avoided any mention of its many offenses against humanity. He’s gone to Korea, to scold the South Koreans for the alleged evils of their economic system, and demand that they try harder to get along with the Communist government in the North. While absurdly blaming “unfettered capitalism” for many of the world’s ills, he has consistently aided and abetted a socialist philosophy that has not only literally murdered tens of millions of people, but has robbed countless others of their rights to liberty and property, as well as their self-respect, work ethic, ambition, ingenuity, and even their right to their own thoughts. “Capitalism” is a pejorative term that Karl Marx used to describe free enterprise. By demonizing capitalism and excusing Communism, Francis is explicitly rejecting freedom in favor of tyranny, slavery, and the devaluation of human life. And why not, as long as he believes human freedom is the greatest threat to the planet? Until Pope Francis cleanses his own mind of this grim, anti-human worldview, we should thank him not to question the pro-life credentials of our nation’s leaders.